At Priory Direct, we’ve set out to be the best supplier of packaging, warehouse, and office essentials that there is, and we believe our same day despatch is absolutely key to achieving that. eCommerce is a fast-moving industry and we’ve found that many businesses struggle to predict order levels so are unable to effectively manage their stock of packaging and label supplies. This small problem then becomes a much larger problem if suppliers aren't able to despatch supplies quickly and leave you for days without your essential supplies. 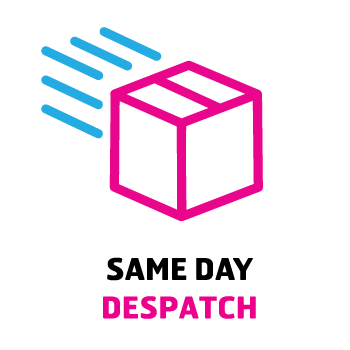 So to help our customers keep their busy eCommerce businesses running all day, every day, we guarantee to despatch all weekday orders placed before 5pm the very same day for next working day delivery. We also include a countdown throughout our website so you can get your order in on time and avoid disappointment or delay. For those real emergencies, we also offer some premium delivery services including guaranteed next working day by 10:30am, next working day by midday, next day by Midday pallet deliveries, as well as some premium Saturday services.